Naruto: Path of the Ninja 2, a sequel to October 2007's DS title, is in the works from D3Publisher and Tomy Corporation, planned for a September 2008 release. It features 30 characters from the series for gameplay that sounds a little bit action-RPG and a little bit squad-building. Wi-Fi multiplayer lets Naruto fans take on friends around the world, too. For ninja battles, presumably. There are a staggering number of Naruto games; Path of the Ninja 2 is not to be confused with Rise of a Ninja, Ultimate Ninja, Ninja Destiny, Uzumaki Chronicles, or Naruto RPG. I'm confused. Full release follows the jump. TOMY Corporation and D3Publisher of America, Inc. (D3PA), publishers of interactive entertainment software, today announced NARUTO™: Path of the Ninja™ 2 for the Nintendo DS™. Everyone's favorite orange-clad ninja returns to the role-playing genre with Path of the Ninja 2, featuring an all-new original storyline, a huge roster of playable characters, an improved combat system and for the first time, exciting Wi-Fi battles. Based on VIZ Media's hit animated TV series NARUTO, NARUTO: Path of the Ninja 2 is scheduled to hit stores in September 2008. "There are huge numbers of NARUTO fans across North America, and we wanted to give them more choices than ever before," said Laura Yoshioka, director of consumer software at TOMY Corporation. "This new adventure will allow fans to play as their favorite character and create their own dream ninja squad as they try to complete an entirely original mission." NARUTO: Path of the Ninja 2 is set to give players a portable outlet for their inner ninja this fall. A deep, original storyline will allow players to access 30 major characters from the series, from standards such as Naruto and Sakura to unlikely allies like the weapons-based Tenten. The improved and intuitive battle system will make it easy for even the newest fighters to get into the combat, using the DS Touch Screen to unleash devastating melee and jutsu attacks on any opponent foolish enough to get in their way. The new Squad Leader and Ninja Tag systems provide even more squad-building options, while the Wi-Fi multiplayer feature offers aspiring ninja the chance to take on challengers from around the world. For more information on NARUTO please visit www.naruto.com. 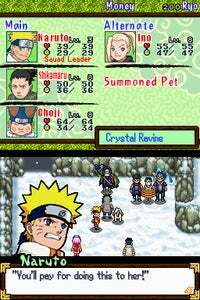 For more information on NARUTO: Path of the Ninja 2, please visit www.NarutoNintendoGames.com.